November marks Osteoporosis Awareness Month in Canada and a great opportunity to learn more about osteoporosis and bone health. 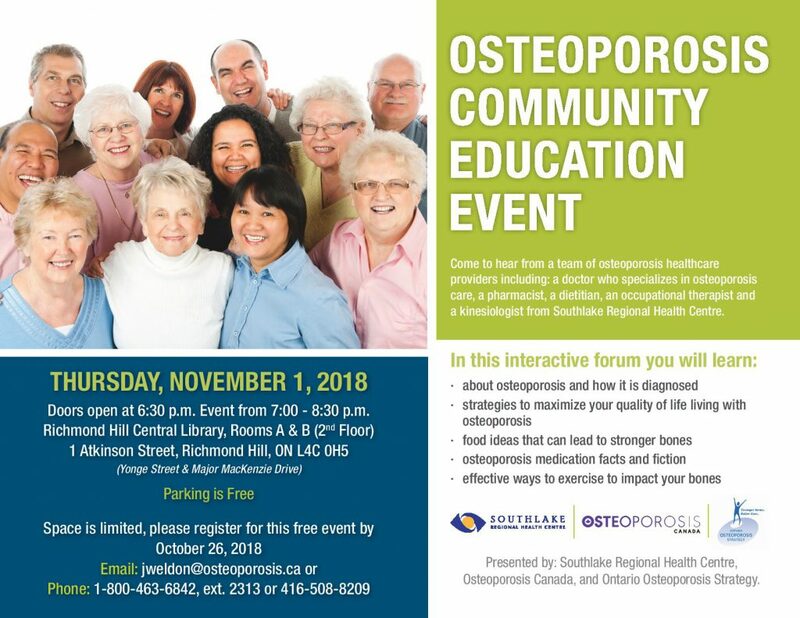 Attend an osteoporosis community education event being held at the Richmond Hill Central Library on Thursday, November 1 from 7 pm to 8:30 pm and hear from a team of osteoporosis healthcare providers. These include: a doctor specializing in osteoporosis care, pharmacist, dietitian, occupational therapist and kinesiologist from Southlake Regional Health Centre. Free parking is available at the Richmond Hill Central Library to event attendees and doors to the event open at 6:30 pm. Space is limited. Please register for this free event by October 26, 2018 by emailing: jweldon@osteoporosis.ca or calling toll free 1-800-463-6842. ext. 2313 or 416-508-8209. The event is being presented by Southlake Regional Health Centre, Osteoporosis Canada and Ontario Osteoporosis Strategy.